Aikido uses the energy of the attacker by blending and redirecting the force of the attack rather than opposing it head-on. This requires very little physical strength, as nage (aikido practitioner) “leads” the attacker’s momentum using entering and turning movements. The techniques are completed with various throws or joint locks. We are a non profit organisation made up of volunteers with the aim of promoting the practice of Aikido. One of the advantages of training with Griffith Aikido is that the club has a very diverse range of experienced instructors (senseis) who each bring their own personal insight into this fascinating martial art. We also endeavour to organise guest instructors and seminars on a regular basis to offer our members alternate views and to challenge their understanding of the principles. Griffith aikido instructors strive to provide a safe, dynamic and supportive training environment based on tolerance, ethical values and universal principles to all who practice at our dojos. The Nathan dojo, on Brisbane’s southside also has a beginner’s introductory course starting on the first Tuesday of each month. 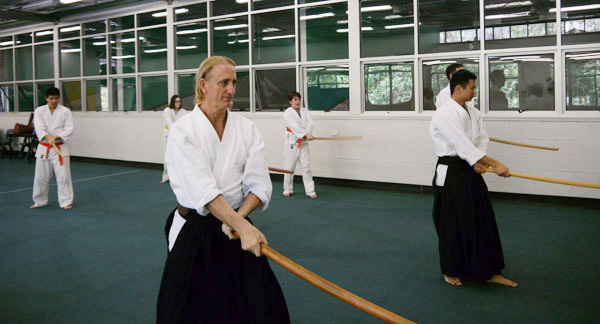 On the north side of Brisbane, we have another Griffith Aikido dojo in Everton Hills. We also have an active Aikikids program at Everton Hills Dojo which is designed to teach aikido to children aged 7 to 13 years.